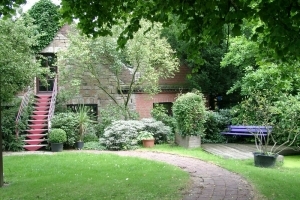 A small hidden paradise has developed over a period of three decades on the five-hectare site of the former Kirchmannshof. Visitors are invited to enjoy the special horticultural experience offered by a wide variety of themed gardens, century-old beeches, oaks, chestnuts and ash trees, various shrubs – some of which are up to fifty years old, a charming rhododendron valley and a biotope complete with springs, pond and marshy meadows. The park reveals new views, colours and moods every season: a charming winter landscape; magnolia blossom in April; flowering rhododendrons and azaleas in May; unusual herbaceous perennials in June; hydrangea blossom in August; and the colours of both exotic and native trees and shrubs in autumn. 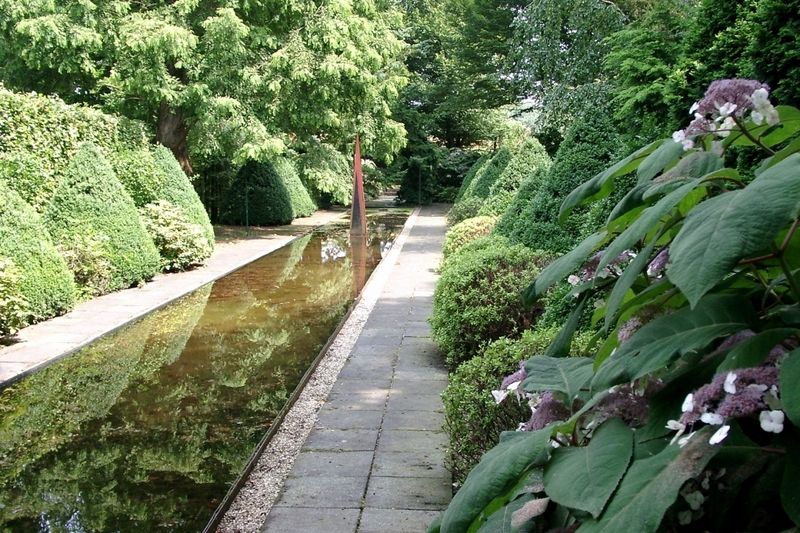 Located on the boundary of a special area of conservation, the idyllic gardens of the Trautmann arboretum can be found on the northwestern edge of the city of Essen, close to Mülheim. A small hidden paradise has developed over more than three decades on the five-hectare site of the former Kirchmannshof as a result of the initiative of company founder and garden expert Hermann Trautmann. 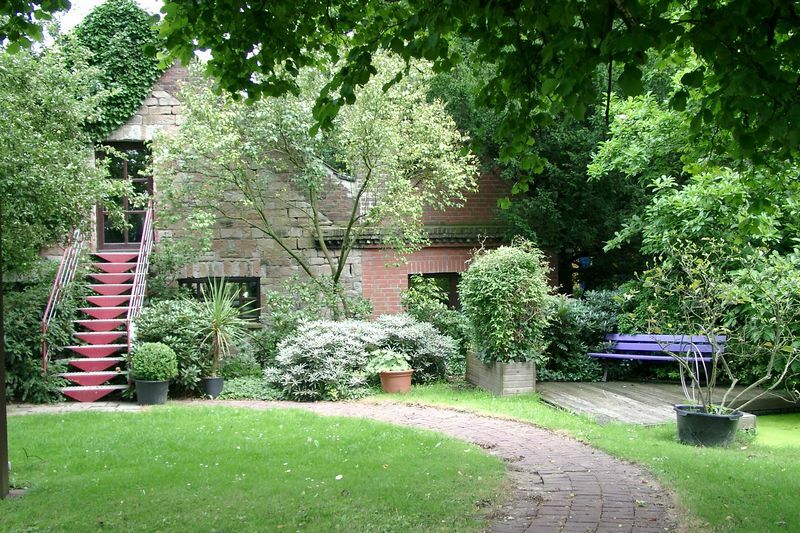 The site is now home to Hermann Trautmann GmbH, a company specialising in garden design and landscaping. Visitors are invited to enjoy the special horticultural experience offered by a wide variety of show gardens, century-old beeches, oaks, chestnuts and ash trees, various shrubs – some of which are up to 50 years old, a charming rhododendron valley and a biotope complete with springs, pond and marshy meadows. A gently curving avenue of large, conically-pruned yews leads the visitor to the heart of the site – the intricate, almost labyrinthine buildings, most of which date back to the former agricultural estate. The latter is mentioned in a document dating from 1632. Splashing fountains, large and small container plants, climbing plants, clamberers and scented herbaceous flowerbeds are used to demonstrate possibilities for designing both sunny and shady patios in harmony with nature. Behind the buildings the view opens out across the surrounding landscape of the special area of conservation. A tall stone vase placed on the line of sight echoes stylistic elements of the baroque and creates an atmospheric contrast between the garden and the countryside. This is a good starting point for a circular walk around the grounds. Bright blue rods guide visitors along a narrow path in and around the rhododendron valley while a barefoot path runs parallel to it. Marshy areas and swampy meadows as well as an enchantingly-located pond fed by springs and fountains have given rise to an unusual wetland biotope here over the years. Pink benches form colourful touches, contrasting with the lush green vegetation. The valley widens out to form a sunny meadow slope, on the edge of which a small rose garden is currently being created with scented roses and old rose species. The path continues to a sunny and semi-shaded area with herbaceous perennials, and then leads back to the farmstead. Clouds and trees are reflected in the long water basin, which is flanked by tall cones of hornbeam and acts as a mirror lake, thus conjuring up a relaxed, almost Mediterranean atmosphere. Just a few steps further along, the path opens out onto a shady clearing with a steep embankment where white, blue and red hydrangeas blossom profusely in July and August. The many small show gardens and themed gardens are stocked with plants for sunny, semi-shaded and shady areas and feature different types of stone, paving and gravel as well as water basins, fountains and small works of art made of metal and wood, thereby showing different aspects of their characters each season. Strikingly-shaped green foliage prevails in the shady gardens while profusely-flowering herbaceous perennials, grasses and shrubs in varied and unusual combinations dominate in the sunny areas. Surprising touches are provided between them by trimmed shrubs such as yews, boxwood and hornbeams. Together with his wife, Hermann Trautmann has created a small paradise of nature and art on his private land over a period of three decades. He would now like to make it accessible to the interested public at certain times.